Scott Kirsner of the Boston Globe (and Wired, Fast Company, etc., etc.) 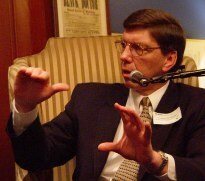 interviewed Clayton Christensen at the MIMC Fireside Chat on February 11, 2004. It was sponsored by Nixon Peabody LLP. The event is by invitation only and was sold out. Clayton is the author of The Innovator's Dilemma, and the new book The Innovator's Solution, which I reviewed last October. Clayton, who went to Harvard Business School at the same time I did, is currently a professor there, and has made a career of trying to help understand issues related to business model and technological innovation. Here is a report based upon some of my scribbled notes. Clayton is a warm, friendly guy, and stands 6' 8", so he's easy to spot in a crowd. He speaks thoughtfully, without fanfare. I found that having read his latest book made a big difference in listening to this talk (though it was also clearly helpful to those that hadn't). With all of the background of the book, his answers fit into a tapestry so much better. Make of a note of that in case you have an opportunity to hear him speak and answer general questions -- read his book first. Scott opened the interview, as he usually does, with a question in a "how did you get here" vein. 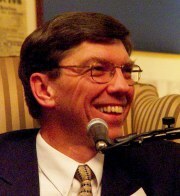 Clayton talked about how he wanted, from an early age, to be the editor of the Wall Street Journal (which he started reading as a child). He sort of tried to direct his studies and career towards that end, but ended up where he is now (an HBS professor and world famous business author) on the way. He joked how he was raised in a low income family, which perhaps influenced why he has "an affinity for the low end". Scott then asked for an explanation of the role of a particular Motel 6 in San Jose mentioned in Polly LaBarre's article about Clayton in the November 2003 issue of Fast Company. (The article is well done and worth reading to understand some of the issues Clayton addresses.) Clayton explained how he was studying the evolution of the disk drive industry (where who were the leading companies changed as technology changed to smaller and small drives and different technologies). Luckily, most of the players were still alive to interview, and many were in Silicon Valley. One day, after having a talk with one player who explained to him why they did what they did, he went back to his room at the Motel 6 and it hit him. There was a limit on the ability of customers to use various improvements, but companies kept trying to sell to their current customers and keep improving and improving. This left room for "worse" products to get a toehold. He still stops back at that place when he's in California. What he saw was his main point: There are forces that help determine when companies succeed or fail, even if they have "good" managers who do all the right things (as measured by normal measures for the normal growth of a company). Clayton told us of his luck in having Jim Porter (of the DISK/TREND Report) give him access to a database of every disk drive ever made. That gave Clayton more data to search for patterns or examine to test theories against than other researchers. His advice to budding researchers: "Build a proprietary set of data." Then mine it over time. He also talked about how his book became popular. Again, it was a series of events that just happened to work out. He pushed his publisher to nominate it for an award, which it won, resulting in a small bump in sales. He ended up speaking in England, and George Gilder learned of the book, and then it appeared in a Forbes article. For some reason, that article was chosen that week to be the cover topic, and they needed someone in addition to the author to appear in the photograph. It just so happened that Intel was one of his clients, and Andy Grove consented to appear. Bingo. 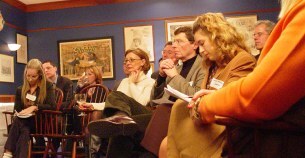 Fame as a business author. "A series of serendipitous events." Scott asked about not always following current customers. Clayton's response: Any given customer can only lead you in a certain direction. So you need to listen to non-customers sometimes. Another observation: A competitive strategy that uses lower cost only works if there is a high cost provider around. As soon as the high cost provider leaves the market, the prices collapse. So, you must constantly move upscale to attack the higher cost providers that have moved there. Dell needs to move up and up (as they are with servers and related hardware) and needs Sun to be there. Scott asked about the low cost airlines. Clayton then discussed the two strategies for competing with disruptive technologies: A Low-Cost strategy and a New Market strategy (selling to people who are not buying in the category). He said that Southwest Airlines went after the type of people who used trains and buses and/or used out of the way airports. That was a New Market strategy. The other low cost airlines are mainly using a Low-Cost strategy. He feels that they can only last 5 years, because the incumbents must go after them on the cost front -- the incumbents can't go up market. When asked about Linux and Google, he discussed how Linux is more modular than Windows and that you can fit it in an appliance or tailor it to an application better. What I realized is that the open source development model encourages a more modular design than many traditional development models, but the customizability of the source code eases application-specific tuning breaking the modularity barrier if you want. This model encourages platform designs that can be molded by small groups for their purposes. Modular architecture is an advantage for certain disruptive products and in mature industries. Interdependent architectures have advantages when you are pushing out every ounce of performance. With regards to Google vs. Yahoo and others, he sees portals (like Yahoo and AOL) as vulnerable to specialist providers (seeing Google as a search specialist in this case). He gave the example of how department stores (like Sears) gave way to specialist stores (like Best Buy). He says things change once you know where to go for things. In the early days you go to the "have everything" place, but later go to the "best" place for each thing. 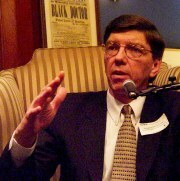 Clayton sees some of the industries that haven't been disrupted recently as education, legal services, and healthcare. They have high cost, variable quality, and low satisfaction. The types of disruption he sees are not simply making things a bit cheaper or more automated. He sees innovation like moving something from the doctor's office to the home, or taking something that used to be done in a hospital and moving it to the doctor's office. It lets you move up market. Just helping make health care more efficient when structured the same way is like "asking a mainframe to be a personal computer". 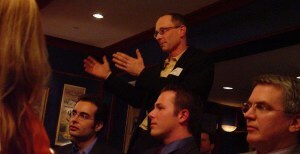 The night then moved to questions from the audience. The first one involved Pharmacology. He started by discussing plastics. "Disruption is a process not an event." In plastics, research used to be done at big companies like DuPont. There was lots of trial and error, and you needed the best, most experienced people in the world to do it. Then, over time, patterns were discovered in the products, so less training was needed. Finally, theories were developed and now you can do "designer" plastics using a "cookbook". It evolved from trial and error to rules based. With health care, he sees needing to move from trial and error, to precise diagnosis (where you distinguish between different causes for the same symptoms using genetic and other techniques) then eventually rules based treatment based on that diagnosis. When that happens, a nurse anywhere will be able to do better than the best of today's Massachusetts General Hospital physicians. (That would be disruptive...) When it comes to drug testing, if you have a better targeting of the population sample used for testing (through full understanding of the disease) you can use a smaller sample size for less expensive testing. Diagnostic-based treatments are often thought of as "KMart quality", but in reality they are of high quality because they are rules based. Simple does not mean less effective in healthcare. He sees venture capitalists as going the wrong way to diagnose good investments, still living in the trial and error stage, but with more and more money to give out giving less and less time to do due diligence. He feels they will be disrupted. He hopes his Innovators Solution book will help move things from unstructured investments to at least looking at patterns. One of these days we'll have rules based. He says only 80-85% of a normal company's R&D investments should be in sustaining innovation, but most under invest in disruptive innovation. In 2004 there will be a new book he's collaborating on: "Seeing What's Next". He says that traditional business school teaching has enshrined data driven decision making. But data is from the past. Seeing the future needs theory, not looking at the past. The book is about this. More on open source: It is a powerful force, which we haven't begun to see the full effect of yet. The key is the modularity, not the freeness. New technologies are rarely plug-compatible with the old. You need to be able to conform the OS to the needs of applications. Desktop to handheld will result in Windows to Linux. Digital Equipment Corporation was at the top of its game during the early PC days. There were no financial indications of trouble until the game was over. That's how it works with disruptive innovation. A question about the media. His response: A huge disruption is downloadable music. If getting music is simple enough people consume an awful lot more music. Record labels don't see that it's an opportunity not a threat. Most media gets "hired to do a job". Disruption will not be in those jobs. So the areas to look at are New Markets, with new "jobs" to be done. Afterwards, Clayton stayed around to answer questions.